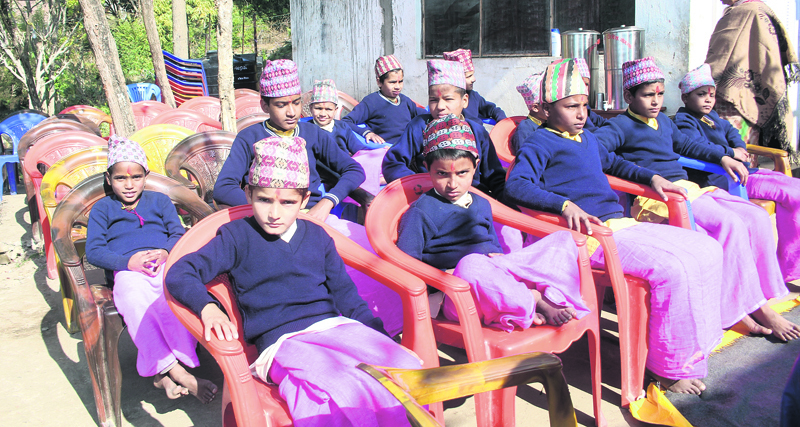 Students of Baudhik Gurukul Vidhyalaya, Gorkha bazaar in this recent picture. GORKHA, Dec 31: Prakash Bhattarai, 9, wakes up at four o’clock sharp every day. He takes bath, chants gayatri mantra and sits for mediation and puja religiously. Then he heads to the Bauddhik Gurukul Vidyalaya (BGV) for attending classes attired in dhoti and kurta. One year ago his life was totally different. He was enrolled in a nearby English school and wore shirt, pant and shining shoes. He used to head for the school with a heavy bag loaded with a dozen of books and notebooks and a heavy lunch box. “This is my first year at the Gurukul. And it’s totally different than my earlier school. I have found it very nice and exciting. I feel I am learning very valuable things here,” said the little boy. Amrit Aryal used to study at the Joseph Academy, a popular English medium school in the district. Now, he’s Bhattrai’s classmate. He is also equally elated about Gurukul. “I was a student of a boarding school earlier. But when I told my parents that I wanted to join Gurukul, they supported me,” he said adding that his family members also wanted him to acquire education from Gurukul so that he can preserve their ancestral culture and values. Gurukul, founded two years ago, is presently providing Vedic education to 17 students from Bajura, Kalikot, Mugu, Chitwan and Gorkha, informed Mohanlal Shrestha, president of the Gurukul’s management committee. Shrestha stated that even though the students are happy in Gurukul, their number is still too low. Educational institution getting registered as Madrasa and Gumba is common in the country. However, Gurukuls are scarce as they rarely receive financial support from the government, an official at the District Education Office (DEO), Gorkha said. But in case of Gurukul, it’s been lucky to receive some funds from the DEO. “Last year we received 168,000 from the DEO. 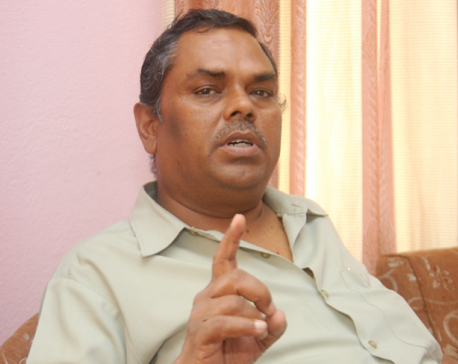 Apart from that we have been operating the school through the interest received from the school’s revolving fund,” said Bodh Prasad Adhikari, secretary of the management committee. The school has a revolving fund of around Rs 1.4 million. “Along with the revolving fund’s interest and support from various organizations including women’s groups and local clubs, the school is also supported by around 39 individual donors. 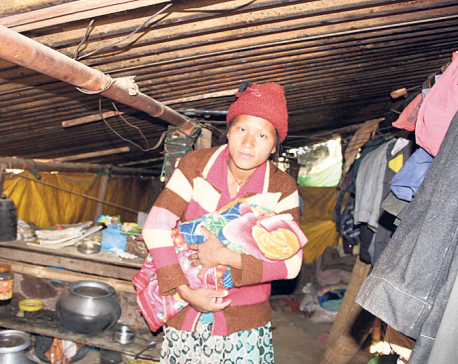 Their financial assistance ranges between Rs 250 to Rs 3000 per month,” Adhikari informed. Despite that, the institution has been facing hassles in building infrastructure for academic activities. Its school building was destroyed by the earthquake last year and since than it’s been operating classes in a nearby old-age home. “We are operating academic activities in the old-age home building. Students have been facing hassles as the building as it is not equipped for conducting academic activities,” he informed adding that they have been putting every effort to collect funds for the school’s new building. The school needs around Rs 100,000 per month to operate and to pay salaries of its teachers. The government doesn’t provide teachers to it. Its curriculum comprises of Vedic and spiritual elements along with government school curriculum.